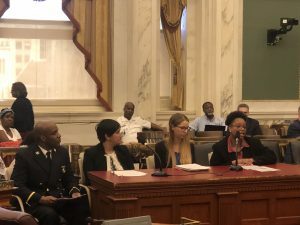 On Monday, April 8th, Cateria R. McCabe, Director of Veterans, Kinship Care and Tenant Rights, testified at City Council before the Committee on Aging chaired by Council member Al Taubenberger. She provided testimony on Resolution No. 180847 regarding emergency protocols that ensure the safety of older people residing in high rises. Including measures taken by other jurisdictions, SeniorLAW Center pointed out the crucial need for safety protocols for seniors as well as those who have disabilities. Read full testimony here. City officials in September 2018 were made aware of an issue at the Pavilion Apartment Building, located at 3901 Conshohocken Ave. According to seniors residing at the property, Pavilion operated without power for a series of days. Residents indicated that they were not informed of the severity of the problem, nor were they kept up to date about the progress of the repairs. A number of residents also indicated that no comprehensive wellness checks were undertaken to assess the health of the building’s senior occupants. Some residents reported that they were unable to quickly leave the property due to the outrage’s impact on the elevators. While the power outage in question was isolated to one location, a number of high rises within Philadelphia rent solely or predominantly to seniors, and the power outage raises important questions about the existence and implementation of emergency protocols in traditional community high-rises that cater to seniors, many of whom are disabled, on a fixed income, and of limited means to address unforeseen emergencies.